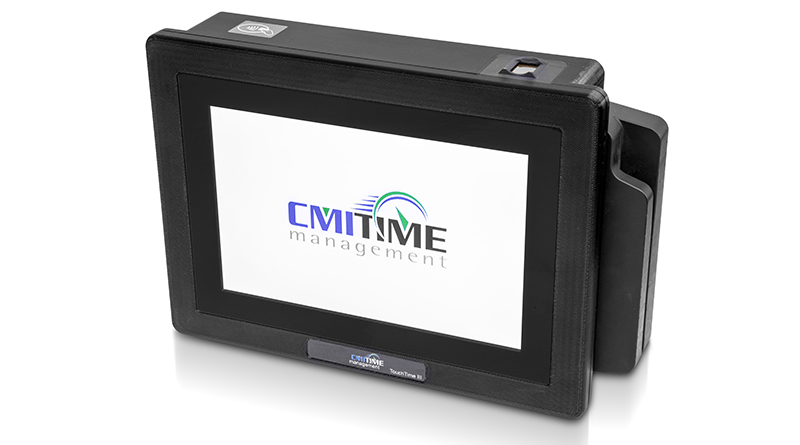 CMI Time Management, a leading global provider of innovative workforce and resource management products for companies in a variety of major industries, announced the release of the latest entry in its proprietary TouchTime line of data collection terminals. Powered by an updated Windows operating system, the TouchTime III time clock and workforce management solution delivers sophisticated employee self-service capabilities designed to minimize time-consuming manual data entry for human resource and operations departments. A Windows 10 operating system with a familiar user interface that runs Java, .Net, and browser-based applications. Simple application development and deployment with CMI’s loading and monitoring system, which facilitates installation and updates of Java-based applications. Easy network connectivity via WiFi, Bluetooth, or Power Over Ethernet. Multiple modular employee auto-identification peripheral options (RFID proximity card reader, fingerprint scanner, facial capture). For more information about CMI Time Management’s workforce management products, visit www.cmitime.com or call (800) 722-6654.